Doc. 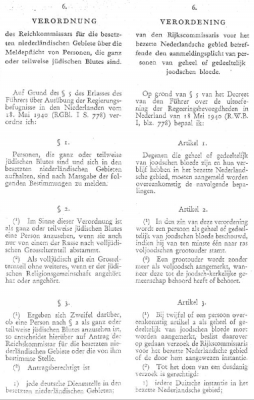 4: Regulation concerning people with "Jewish blood"
Focussing on the specialized bureaucratic procedures and the interaction between German and Dutch officials, this material shows the way in which the registration process was planned and how the data were collected and transferred. From another perspective, it also hints at the devastating consequences of registration for the registered and, finally, offers a glimpse into the way in which Dutch society has traditionally dealt with the question of collaboration. 1. In analyzing the case of Dutch registration, the United States Holocaust Memorial Museum argues that the Dutch officials betrayed their democratic traditions by cooperating with German officials. Do you agree with this point of view? 2. 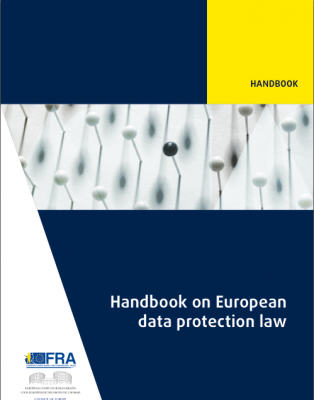 Modern states collect an enormous amount of data about their citizens. What are the challenges for officials today? 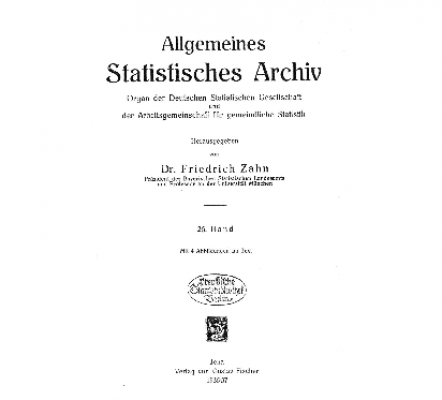 Article by two leading Dutch statisticians in the German journal “Allgemeines Statistisches Archiv” in 1936 dealing with “Papiermenschen” and the interest of the State in Registration. Source: General Statistical Archive Vol. 26/1 (1936), p. 59 et seq. 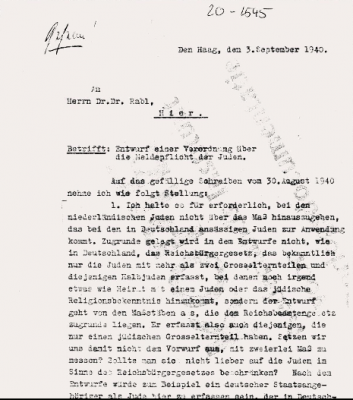 Secret letter by the head of the main department of the Generalkommissar für Verwaltung und Justiz to the head of the department state law of the Reichskommissar, 3 September 1940, discussing a draft of an ordinance for an obligatory registration of the Jews in the Netherlands and the racist categories to be used. Source: Nederlands Instituut voor Oorlogsdocumentatie, 20, 1260. First Regulation to the Reich Citizenship Law, November 1935. Source: Reichsgesetzblatt, I, p. 1333. 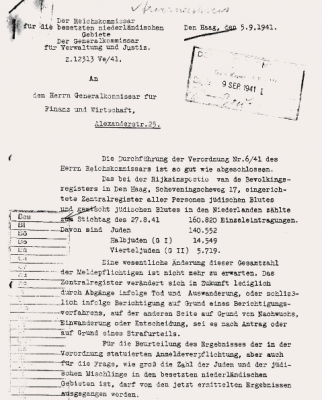 Regulation of the Reichskommissar concerning the obligatory registration of people with Jewish blood, 10 January 1941. Source: Order for the Occupied Dutch Territories, VO 6/1941. 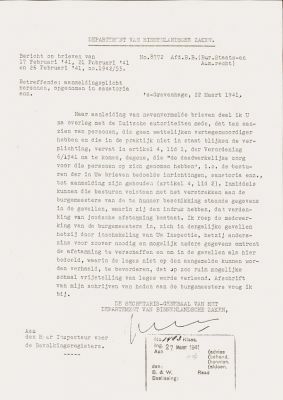 Letter of the Dutch Secretary of State of the Ministry for the Interior to the Head of the Registration office, 22 March 1941 about the registration of “doubtful cases” in the care of sanatoria. Source: Archive of the House of the Wannsee Conference: Memorial and Educational Site. Report by the Generalkommissars für Verwaltung und Justiz, 5 September 1941, about the result of the registration in the Netherlands. Source: Nederlands Instituut voor Oorlogsdocumentatie, 20, 1260, 77, 1260. 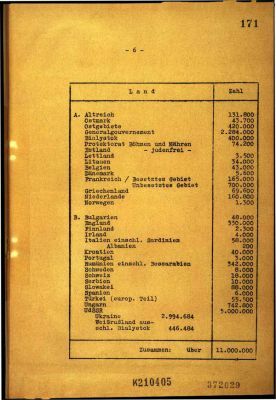 Extract from the protocol of the Wannsee-Conference, 20 January 1942, noting the number of “Jews” in the Netherlands. Source: Political Archive of the German Foreign Office, R.100857. 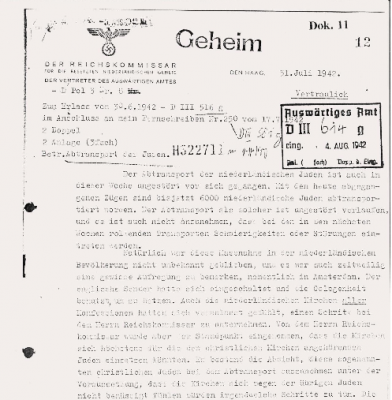 Report of the representative of the German Ministry for Foreign Affairs in the Netherlands, Otto Bene, 31 July 1942 about the first deportations and the view the Dutch Secretary of State of the Ministry for the Interior held about them. Source: Political Archive of the German Foreign Office, R. 100876. Despite their neutrality, the Netherlands were occupied by German troops in May 1940. The royal family and the cabinet fled to Great Britain. Shortly afterwards, a supervisory administration of about 2,000 officials was established under the Reich Commissioner Arthur Seyß-Inquart and his four General Commissioners. Even though the Low Countries had a long history of religious tolerance, anti-Jewish measures were quickly enforced. These were accompanied by brutal street violence by both the German police and army officials and Dutch Nazis, the NSB. The German authorities even set up a “Jewish District” in Amsterdam – the only Ghetto in occupied Western Europe. 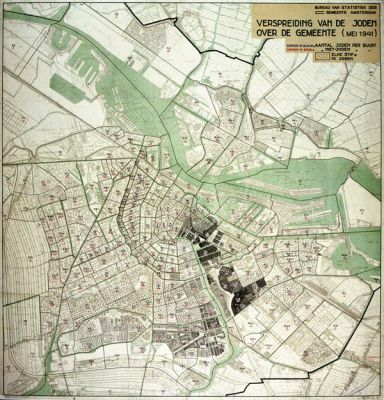 In the course of planning the Ghetto, the municipal officials had already counted all citizens of the Jewish faith in Amsterdam and marked the numbers on a map. Yet the aim of the Nazis was not just to persecute practicing Jews, but everyone whom they regarded as being of the Jewish "race", calculated on the basis of the religious affiliation of their grandparents. After long discussions, all inhabitants of the Netherlands with just one Jewish grandparent were registered in 1941. Although this went beyond the categories used in Germany, this number (160,800) was included in the protocol of the Wannsee Conference. It was decided during the conference, however, not yet to deport people with one Jewish grandparent, or with two Jewish grandparents who had neither been married to a Jew, nor born into a Jewish marriage, nor been member of a Jewish congregation. Nonetheless, the data of the remaining 140,000 registered Jews was used to plan and implement the deportations. 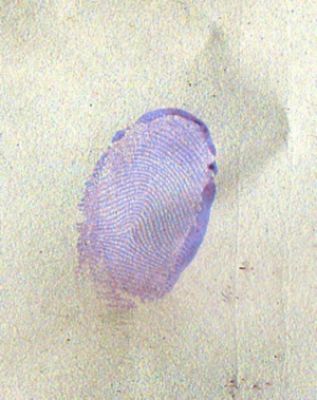 After their registration forms had been marked and their IDs stamped with a "J", any official – whether a Dutch policeman or a German SS guard – could easily ascertain whether or not any passerby was Jewish. This made escape very difficult. In the end, 107,000 Jews were deported, of whom approximately 102,000 were murdered – a much higher death toll than in any other Western European country. In Belgium, where the German army was in command and registration was far less systematic, "only" 28,952 of the approximately 64,000 Jews were murdered.